Mrs Tonya Grant was appointed Chief Internal Auditor for The Jamaica National Group on February 1, 2017. In this role, she facilitates the accomplishment of systematic and disciplined methodologies to improve the effectiveness of the organisation’s risk management, control and governance processes. Mrs Grant was employed to the Jamaica National Building Society as Chief Internal Auditor for more than 15 years. As Chief Internal Auditor, Mrs Grant was instrumental in improving the level of efficiency within the internal audit function, by automating the audit risk assessment, work paper documentation, review and reporting processes as well as a centralised audit issues tracker. Automation has contributed to easier accumulation and analysis of data; sharing of knowledge; and, consistently promotes audit methodology, through the use of templates. In addition she has been instrumental in implementing continuous auditing routines through the use of data analytics solution for some key business processes. 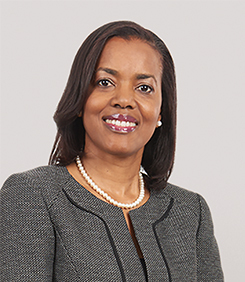 She previously worked for more than 10 years at KPMG and has participated in diverse internal audit, data analytics, Anti-Money Laundering and leadership conferences and seminars.